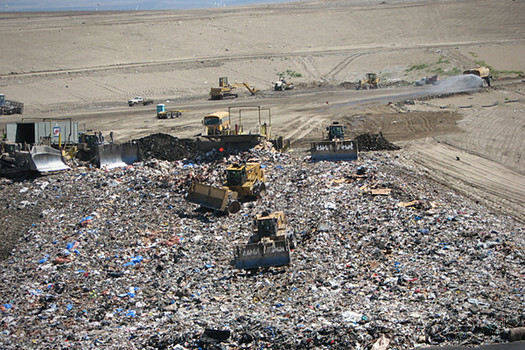 Pictured above is a landfill–the place where unwanted waste is disposed of. Huge mounds of waste are dumped into behemoth holes in the earth dug specifically to hold everything discarded by humans. While much of what people toss into heaps is recyclable, people choose to bag it and drop it in their garbage cans along with a large amount of compostable waste, purely for convenience. Only around 25% of recyclable materials currently make it to recycle centers due to human laziness. Now, some haulers are trying to capitalize of people’s lack of knowledge and dump their recyclables in one container while ignoring glass, polystyrene and batteries. Shame, shame! SEDONA, AZ: Sir William Randolph, World Famous Publisher of the Sedona Excentric and Director of ExcentricWorld.com, stood at the podium in front of the plethora of microphones at the lot next to El Portal, Sedona, after breaking fast there, to address a global audience with regard to people’s waste. 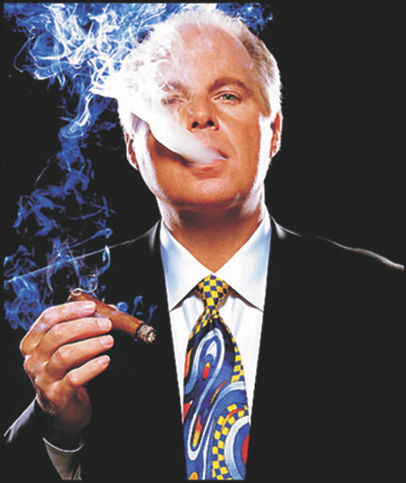 “With the rhetoric flying around the capital beltway and throughout pundit-land everywhere,” he began, after clearing his throat by gargling a liquid from his monogrammed flask, “I felt I should hold a press conference and relay to you some episodes and events that already have shown to have a significant impact on society, locally and globally. 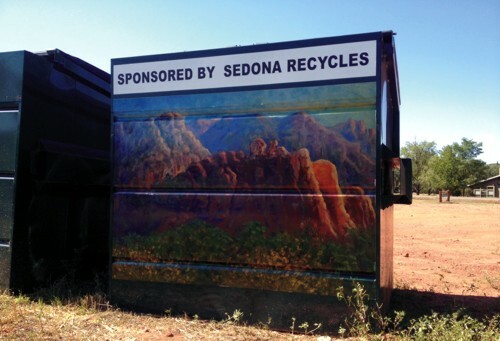 I’ll begin by telling you that your own Sedona Recycles needs your support. This group of dedicated workers is doing everything possible to keep your waste out of landfills. “They are now even taking blocks of polystyrene foam, and dealing with lower valued packaging. Besides that, some people think the bins are their personal dumping grounds. You’d be amazed at how much waste they have to sift through to send clean materials to be recycled. We’re talking dirty diapers and all. So, next time you stop by to drop off your stuff at your recycling center, hand them a hefty check with your gratitude for their tireless efforts to help you be a better steward of your surroundings. “What about rumors of robotic waste coming out of Canada?” asked a reporter from Sedona’s small, other paper. The crowd erupted with raucous laughter. “If it appears that I am ignoring you in the foreseeable future, take it personally.” Sir William gargled again, possibly feeling the effects of some bug that had been permeating the Verde Valley since the holidays. 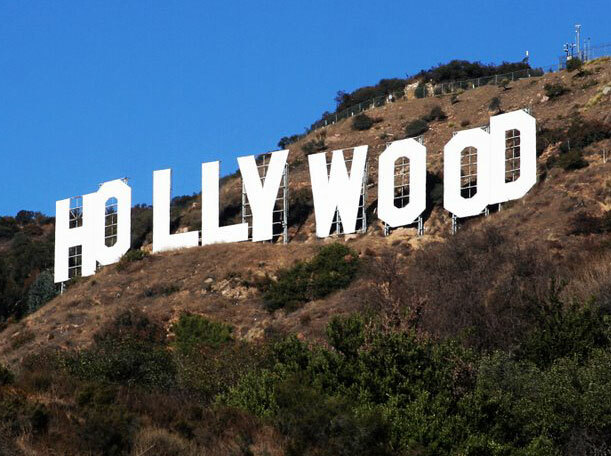 According to recent news reports, the 2007 renovation, while the country’s financial status was rapidly heading south. No detail was overlooked, from a $3,500 sub-zero refrigerator and a $689 faucet to a $600 toilet. Even the vintage tissue holder cost $65. The story came from ABC, which first filed a Freedom of Information Act request on the renovation four years ago. Above is an example of waste on many levels. This extreme case of narcissism wastes time, energy, space and natural resources. “You seem to be getting pretty diverse with your definition of people’s waste, Sir William,” stated some guy. “Can you give us an example?” asked an obviously concerned listener. “The final kind of people waste is human waste coming from our mouths, usually spewed by an intolerant, prejudiced, ignorant naysayer. It’s foul and worthy of proper disposal in the gutter it evolved from. “So, my friends, waste not, want not. That’s what I always say. Or, maybe I say it at least once a year. I didn’t mention anything about being wasted, but that is for another day. Many of my high sources fall into that category. That being said, Sir William gestured to the crowd and ascended into his waiting limousine.